Old plastic materials that cannot be recycled because they contain too much “impurities” could find a final incarnation in car’s combustion engines, campaigners have said, warning of “a dangerous precedent”. “It’s very controversial as it could create a precedent for including fossil-based fuels in the renewables and climate policy,” said Janek Vahk, a campaigner at Zero Waste Europe, an environmental campaign group. “Moreover, it could undermine countries efforts to address the issue of plastic recyclability,” Vahk said. In its proposal for a revised renewable energy directive, the European Commission listed “waste-based fossil-fuels” among the non-recyclable waste that can be converted into energy, such as renewable electricity or transport fuels. “‘Waste-based fossil fuels’ means liquid and gaseous fuels produced from waste streams of non-renewable origin, including waste processing gases and exhaust gases,” the Commission said in its original proposal. An amendment introduced by the European Parliament in a subsequent plenary vote in January further fleshed out the proposal by adding waste “produced from solid waste streams” to the definition — in other words, plastics. The idea is now picking up steam in the EU Council of Ministers, with four member states — the UK, Finland, the Netherlands and the Czech Republic — backing the plan. 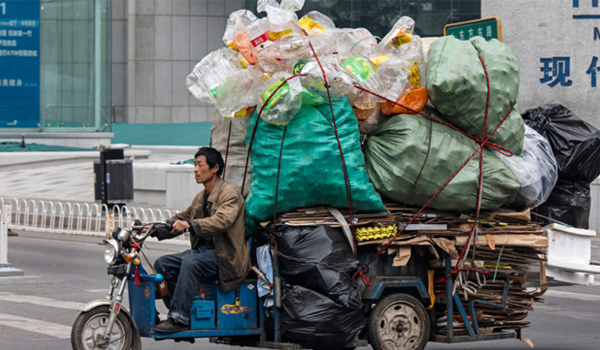 It gained further momentum after China’s decision to ban all imports of plastics and other recycled waste from Europe and other countries. But environmental groups are worried and have written to EU legislators saying they were “deeply concerned” about the inclusion of plastics within the definition of renewable fuels. “We believe that this inclusion is a harmful distortion of the concept of renewable energy, and inconsistent with EU circular economy and climate policies,” reads a letter written by a coalition of environmental groups, sent to EU legislators on 2 May. “Fuel production from non-renewable solid waste such as plastics is equivalent to the use of fossil sources, and therefore the opposite of renewable energy,” the coalition said. Ambassadors from the 28 EU countries are meeting on Tuesday (8 May) to discuss the amended renewable energy directive. But some members of Parliament are now having second thoughts. “They realise now that this approach could pose some problems and are looking for some safeguards,” Vahk said. Bart Martens, an aide to Belgian MEP Kathleen Van Brempt, who helped draft the amendment voted on in plenary, said the introduction of waste-based fossil fuels in the renewables directive was always part of the plan. “The only thing that Parliament did was adding extra safeguards to ensure this respects the waste hierarchy” and prevents unrecyclable plastic waste ending up in incinerators, Martens told EURACTIV, reminding that the compromise amendment was approved by a large majority of political groups in Parliament.